Our showroom manager, Jessica White, was recently interviewed for the Capital Gazette for a featured article in their Fall Home & Garden insert. It discusses ‘6 quick and budget-friendly ways to upgrade your kitchen’. This entry was posted in News on September 13, 2016 by adminKitchenEnc. 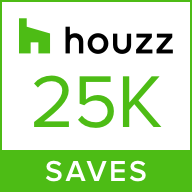 Houzz just awarded us with a badge for having over 25,000 photo saves in the Houzz community! Thank you to our fans and followers, and to our client’s who’s beautiful projects helped us reach this milestone! Help us earn another badge for Best of Houzz 2017 by visiting our Houzz profile and writing a review! This entry was posted in News, Uncategorized on August 26, 2016 by adminKitchenEnc. We’ve had the pleasure of forming such a strong bond with our partners at Annapolis Home magazine over the years. They were nice enough to come out to our 35 Year Celebration here at our showroom in May, take photos, and do a very nice spread and story on Mark in the current July/August issue! You can view the full issue on-line here, or by visiting our showroom and picking a copy up for yourself! This entry was posted in News, Uncategorized on July 20, 2016 by adminKitchenEnc. Owner, Mark T. White, has officially earned his CMKBD Certification through the National Kitchen and Bath Association (NKBA). This entry was posted in News on July 7, 2016 by adminKitchenEnc. Mark White and one of his recent projects were featured in a ‘Designer’s Spotlight’ by Hubbardton Forge this week! This entry was posted in News on June 3, 2016 by adminKitchenEnc. The Capital Newspaper just announced the finalists for the Reader’s Choice Awards for 2016!! We are proud to announce that you all chose us as the Winner for the Best Kitchen and Bath Design!! Thank you SO much to our families, friends, clients, and business associates who voted, and for your continued support over the last 35 years!! This entry was posted in News on May 24, 2016 by adminKitchenEnc. The November 2015 issue of Capital Style magazine featured a section entitled “How to Choose a Pro”. Kitchen Encounters did a feature with recommendations on what to look for when you begin your search for a Kitchen Designer for your project! This entry was posted in News on March 24, 2016 by Jessica White. This entry was posted in News on March 22, 2016 by Jessica White. That’s right! This Spring of 2016, Kitchen Encounters will officially have been in business for 35 years! Let’s flash back to 1977. After previous experience of driving interstate tractor trailers, framing houses, and customizing vans, owner Mark T. White, felt that doing something more hands-on would be a job he would enjoy. He started working for a company making custom countertops, and really liked what he was doing. He was proud of the final product and loved seeing how happy the homeowner’s were and how much they appreciated the beautiful craftsmanship. That company ended up going out of business about two and half years after starting there. However, that experience opened Mark’s eyes to some of the frustrations that homeowners were having with kitchen designers and installers, which led him to opening his own business. Mark’s sister, Cindy (who is our Financial Manager) loaned him about $800 to buy the basic tools he would need to continue making custom countertops. He rented a friend’s basement and built an apartment in one corner, and used the rest of the space as a workshop. From there, he moved his workshop into a large garage off Hudson St. About a year later, he moved into a warehouse on Legion Ave in Annapolis, where he continued to make countertops. After some time, a cabinet dealer was looking for space to have a display in the Annapolis area, and so he offered the front of the warehouse, where the office space was located, to act as a showroom. It was then that Mark was truly inspired to become a kitchen designer. In 1997, Mark bought a small 1950’s cottage, where Kitchen Encounters resides today, in the heart of the Annapolis Design District. The three bedroom home was transformed into a functional showroom, with our offices in the basement. The showroom maintains a home-like atmosphere, while housing about 10 display vignettes featuring different cabinet styles, features, and functions. After years of focusing on different aspects, and offering the full package (design, construction, and installation), he realized that his strong points were in the cabinetry and design itself. Mark developed the Interactive Design Process to ensure that comfort, beauty and function merge successfully in a remodeling or new construction experience. This process has since been taught nationwide at industry events, NKBA Chapter meetings, and through developing a course at the local community college. By using numerous sketches to illustrate design possibilities, our clients are able to identify features that fit their lifestyle. The preferred design elements are then combined into the best plan for the project. As we enter our 35th year in business, Kitchen Encounters has received about 50 different awards and recognitions, has been published in over 35 different publications, with over 100 appearances, featuring almost 80 different projects, plus about a dozen projects have been featured on HGTV. Reaching our 35th year in business wouldn’t be possible without our friends, families, design team members, business associates, clients, and neighbors. We want to thank all of you for your continued support, and here’s to another 35 years! This entry was posted in News on February 11, 2016 by Jessica White. Here is the on-line version of the NKBA magazine with the winning projects and a brief description of each! You can also view photos of all the winning projects on the NKBA’s Pinterest Board! Look for projects with Mark T. White’s name underneath for his award winning kitchens! This entry was posted in News on February 5, 2016 by Jessica White.